My first job was logistically ideal. It was so near my house that I only had to take a tricycle to the highway and then walk to our office. When I passed the bar exams, I had to attend hearings and the like and so I would borrow my mom’s car every now and then as needed. I don’t know if she got tired of me borrowing her car, or got fed up with my sister and I squabbling over who would use the car (FYI my sister worked in a pre-school near our house and she could have easily commuted there too, but for some reason, she refused to commute! ), or perhaps she saw how my salary went mostly to important stuff like shoes and clothes, but one day, out of the blue, my parents decided to buy me a car. Just like that, I suddenly had my own car. But the story doesn’t end there, because my parents only shouldered the downpayment while I was expected to cough up the monthly amortization. So there I was, barely making Php19,000/mo. before taxes, and had to pay Php10,000 monthly for the next 3 years. Eh? 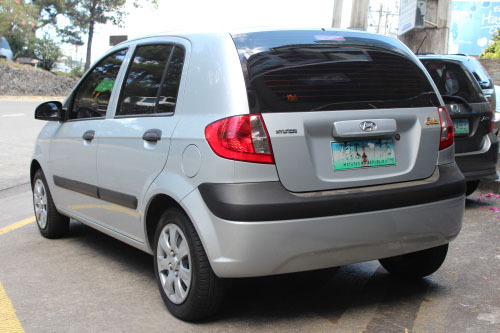 And before you could say goodbye impulse shopping at Alabang Town Center, I had to suddenly become fiscally responsible for my first ever dependent, Toyang the Hyundai Getz starter car. I racked my brains to think of how I could come up with extra income to fund my little gas guzzler, and wouldn’t you know it, a few weeks later, a friend came to me with a legal emergency that needed mending ASAP. Of course I charged her the “presyong kaibigan rates” of our law firm, but even with that, I had more than enough to cover the amortization for the next few months. When the case was finally settled amicably (you’re welcome! ), I was happy for my friend but honestly dreaded the loss of commission from her account. And then with almost comically perfect timing, I got tapped for a writing job, also with my law firm, which I gamely sunk my teeth into. I made my last car payment around this time last year, which made me sentimental enough to write this post. While it might seem as if the extra income were gifts handed down by the Universe, they weren’t. To be honest, I’ve always had job offers in one way or another that could have easily augmented my income, but because I was happy where I was and with the little I was earning (simple girls don’t need much), I didn’t think it was worth the stress to take on a sideline. But having Toyang to feed and look after, made me put on my racket girl outfit and forced me to make things happen. So while it would be easy to trade up and buy something prettier, I will always look at Toyang the Getz with fondness because she helped to mould me into the fabulous woman I am today. Without Toyang the Getz, I would probably still be spending hours in front of the TV, frying my brain with too much CSI, NCIS and The Food Network. But as it is, I now have to work, work, work, and I must admit, that’s the way I have come to like it. 1 Comment on Go Getz It! I hear you! I’m an expat on family visa (not dependent on a job to stay in the country) and I used to quit jobs whenever I felt like it haha However, since signing up for 2 vuls (1 each for hubby and I) I need to stay in my current job to pay for the vuls.